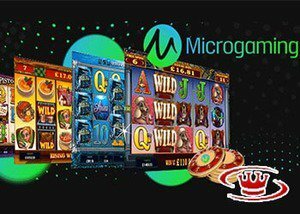 The leading online casino software provider Microgaming released two new slots earlier this month. Try King Tusk and Lucky Links with your Microgaming No Deposit Bonus. King Tusk and Lucky Links were released at all Microgaming casinos and include some of the most prized bonus features: free spins, multipliers, wilds, scatters, and everything in between. Players can look forward to stepping into a world of wins by exploring the new slots on multiple platforms, including iPhone and iPad. Take a trip to Africa where the animals roam the reels and unlock big wins. The new King Tusk slot features symbols of elephants, beetles, lizards, and pots, which are set against a vast African landscape while bonus features could result in achieving a big win. Speaking of which, there are three different free spins bonuses to look forward to, each of which will award 20 free spins and a mystery wild. Also keep a look out for the King Tusk symbol, when this symbol lands on the reels it can substitute for other symbols (except the scatter) and complete winning combinations. The symbol can also expand randomly to boost payline wins. The new King Tusk slot has an average return to player percentage (RTP) of 96.4%, which makes it a perfect game for your Microgaming no deposit bonus. Expect the unexpected in Lucky Links, an online slot that is receiving rave reviews for its link-locking feature. Central to the new Lucky Links slot is familiar symbols of clubs, hearts, diamonds, and horseshoes, each of which spins across 5 reels and 20 paylines for a maximum payout of up to 352x your original bet. The appropriately named Lucky Links Feature is activated when stacks of linking symbols appear horizontally across the reels. The more symbols link together the bigger the prize. The result is re-spins, extra re-spins and lots more. The Lucky Links logo is the wild and, apart from the ability to substitute for other symbols (except the scatter), pays out up to 7x your original bet when in a 5-of-a-kind win. The new Lucky Links Slot has a return to player percentage (RTP) of 96.7%, thereby making it a wonderful slot to play with your Microgaming no deposit bonus. There are plenty of Microgaming No Deposit Bonuses available to discover big wins in King Tusk and Lucky Links. We recommend Win Paradise Casino, where a $35 No Deposit Bonus can be claimed by registering an account. The site offers an impressive game selection and was founded in 2017 to provide players with innovative promotions, fast payouts, and fair gaming. The Win Paradise Casino software is also compatible with all major mobile operating systems, including iOS, Android, Windows, and Blackberry.